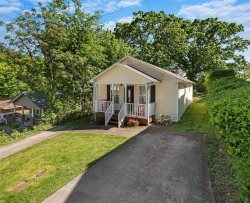 North Chatt Charmer, Just Added! Bungalow moments from restaurants and shops. 50% Down To Reserve. If you are staying in one of our downtown Chattanooga properties, or when you make a trip into the city, one good date folks enjoy is some art, and some art. Perched atop a bluff line overlooking the Tennessee River, you will find the Bluff View Art District. One of the places in Chattanooga to find the two arts. The first art is the Hunter Museum of American Art. this wonderful museum has some amazing pieces for reflection and discussion. Admission is relatively inexpensive at $15 per person with free admission for children under 17 with a paid adult. There are also discounts, $14 for a senior or educator discount and $12 for retired military. The first Thursday of the month is Throwback Thursday and visitors can view the permanent collection for free. The museum’s hours are as follows: Monday, Tuesday, Friday and Saturday from 10am to 5pm, Wednesday and Sunday from noon to 5pm, and Thursday from noon to 8pm (those are eastern time). Some of the permanent collection artists include Daud Akhriev, Karen Appel, John James Audubon, and Ansel Adams, and those are just the A’s. This American art museum has over 300 paintings, 133 photographs, 171 art sculptures, and 139 decorative art pieces, and much more. There is also a wonderful outdoor sculpture garden which is lovely to wander through in fall and spring. Periodically, there is live music and sometimes even a yoga class. There are also classes for children and adults, and traveling art exhibits visit here fairly frequently. For the experience, imagine the hush of the gallery. There are a few people milling about, talking softly about how art moves them or questioning what the artist was thinking. Sometimes the docent is about, whispering to patrons about why there is a certain building in almost every landscape or what the use of color and light signifies. Leave refreshed, renewed, and with great conversational topics for the next ‘art’ experience. The Bluff View Art District is filled with the art of house-made bread, house-roasted coffee and homemade pastries. I know, how many times can I write homemade our house-made. Such repetition is frowned upon in the written word, but it is just the way it is. It’s homemade! Head to Tony’s Pasta Shop and Trattoria and the second art appears in the form of house-made pasta and sauces with origins in the old country. Tony’s will fulfill your Italian dreams. If you can, go upstairs and sit outside on the patio overlooking the Tennessee River. Take your time to enjoy bread, wine, and a lovely dinner. The view is beautiful, and there are wind art installations in the surrounding gardens. Talk about what you saw at the Hunter and take some time to just be together. As you finish dinner and the light fades, extend your evening by walking across to Rembrandt’s Coffee House. Queue up to order an espresso and tasty pastry. Sit outside and wind up your evening on a sweet note.